Matthew 11:28-30(KJV); Come unto me, all [ye] that labour and are heavy laden, and I will give you rest. Take my yoke upon you, and learn of me; for I am meek and lowly in heart: and ye shall find rest unto your souls. For my yoke [is] easy, and my burden is light. The yoke of Christ is easy and His burden is light. What makes serving God easy is when we serve under the yoke and burden of Christ. What makes prayer easy is when we pray under the yoke and burden of Christ. What makes building ministry easy is when we do so under the yoke and burden of Christ. Every time you find yourself struggling under a difficult yoke and a heavy burden, ask yourself if it is the yoke or burden of Christ. The Bible speaks of a stone being heavy (Proverbs 27:3). The stone is a spiritual representation of the ministry of the law. When you serve, pray or minister under the law, you will feel overly burdened; service to God will feel heavy, prayer will feel heavy and all other areas of ministry will feel heavy. The yoke and burden of Christ is a yoke and burden of grace; it is light because it is not you at work but God is at work in you to will and to do according to His good pleasure (Philippians 2:13). Paul laboured more abundantly than all his brethren because he laboured under the burden and yoke of grace (1 Corinthians 15:10). Child of God, Christ has called you to take His yoke; this means embrace His grace. His great name be praised! FURTHER STUDY: Psalms 116:7, 1John 5:3Amp. 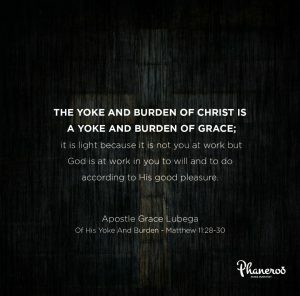 The yoke and burden of Christ is a yoke and burden of grace; it is light because it is not you at work but God is at work in you to will and to do according to His good pleasure. PRAYER: My Lord, I thank you for this great day. I thank you for the grace to labor and minister out of rest. My strength is renewed daily. I run and never grow weary. I walk and never faint. I serve and labor out of an abundant overflow of grace. In Jesus Name. Amen.